As many of us age, we start to notice pigmented blemishes on our skin. 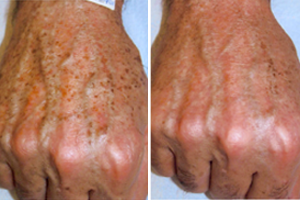 Age spots are flat, pigmented spots on the skin and are also called Solar Lentigines, “liver spots”, or sunspots. Age spots are the result of excess production of melanin. You are most likely to develop age spots on the areas of your skin that receive the most sun exposure, including your face, shoulders, forearms, and backs of your hands. While cosmetic lasers can take care of these blemishes, intense pulsed light treatments also work well, are faster and are less expensive. At the Asarch Center we offer Intense Pulsed Light (IPL) which delivers energy to target and destroy vascular and pigmented lesions. 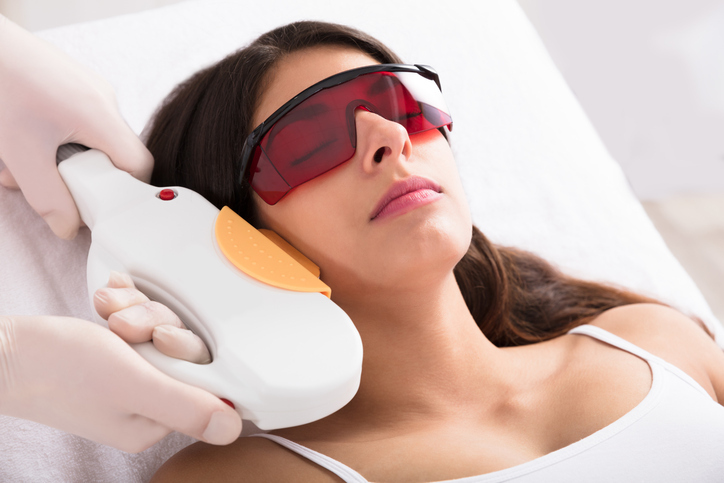 Pulsed light devices deliver energy to target and destroy vascular and pigmented lesions associated with acne, spider veins, facial vessels, rosacea, sun damage, age spots, and other benign skin blemishes. During the treatment, light energy is delivered to the skin through a series of pulses. Using the principle of selective photothermolysis, these treatments target different chromophores in the skin, which selectively absorb the laser or light energy as heat and produce the desired response. 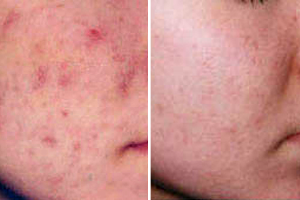 Acne IPL treatments with Palomar®technology target and destroy the skin bacteria responsible for acne to help prevent future breakouts from occurring on faces, chests and backs. To treat acne scars, we use pulses of laser light to coagulate scar tissue and trigger healthy new tissue to form in clients’ skin. Healing time is minimal, infection risk is eliminated and clients feel little to no pain. 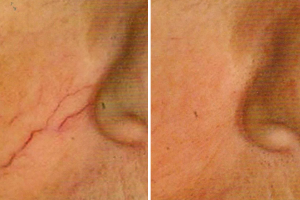 The broken blood vessels that occur so frequently on the face, especially the nose and cheeks, can now be cleared using intense pulsed light. This advanced IPL allows the removal of these vessels without bruising or crusting at the treatment sites. There is a transient pinkness that develops in the treated area that may last 1- 1 ½ hours. Make-up can be immediately applied after the treatment if desired. Usually, 2 to 3 treatment sessions are needed depending on the number of blood vessels present. The unsightly flat brown spots that occur frequently in sun-exposed areas, e.g. the face and hands, can be removed using the Intense Pulse Light treatments. After treatment, the skin in the areas treated will become dark and peel off in 7-10 days. Usually, 2 to 4 treatments are needed to achieve the desired results. Adequate sunscreens are necessary at all times and the use of a skin lightening agent is also beneficial. Stretch marks are the result of collagen loss in the second, deeper layer of the skin and often appear first on the skin surface as reddish or purple lines. These lines usually fade gradually to a lighter, silver or white color. They are most likely to appear in places where a higher concentration of fat is stored, such as the abdomen, breasts, back, thighs, hips, and buttocks. IPL uses a specific wavelength of light to fade the reddish discoloration of stretch marks and also help to stimulate collagen to plump the skin. A series of IPL treatments can improve the appearance of pink or red stretch marks. IPL does not work for stretch marks that have faded with age to silver or white. IPL uses short blasts of a high-intensity light to penetrate just below the skin’s surface, damaging either the melanin that makes up brown “age spots” or the blood vessels that create broken capillaries. Your skin then repairs the damage, leaving you with a more even skin tone. Typically a minimum of three treatments are performed at monthly intervals for optimal results. You may require follow up depending on your individual skin condition. Minimal recovery and downtime are required with Intense Pulsed Light. Your face may be mildly red for several hours after the procedure but will then subside. Pigmented areas on your skin will become darker initially, and then flake off in one to two weeks. You will need to avoid the sun as much as possible before and after the treatment. Sunscreen with a minimum of SPF 30 should be utilized daily, especially after treatment. The ideal candidate for IPL is someone with light skin who has sun damage, broken capillaries, and some lack of firmness. 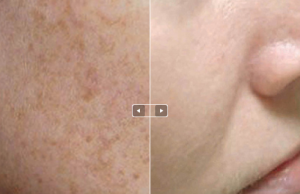 IPL is commonly called a photo facial and is not the same as a laser treatment.